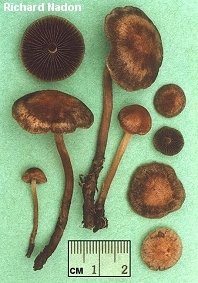 A dark brown to purple-brown or black spore print. Grayish, brown, or blackish caps that are usually conic or bell shaped. 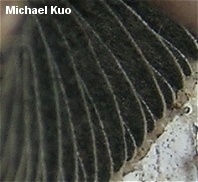 Gills that become mottled with shades of gray and black as the spores mature. Spores with an apical germ pore. If you think it might be worth your time to keep a dangerous chemical around so that you can get it near your eyes in order to watch for fading spores through your microscope, I can't stop you. But I can tell you that it's probably easier--and safer--to simply try keying your mushroom out as a Panaeolus (about 30 described species worldwide) and, if things don't work out, then take the Psathyrella Challenge (Alexander Smith's 1972 monograph describes 414 species for North America, most of which were collected once, by Smith). Beyond a few "easy" species, identification in Panaeolus requires microscopic examination, a good interlibrary loan desk, and the ability to read French and German. The two major monographs of the genus (Ola'h, 1969; Gerhardt, 1996) are unfortunately not in English, and are hard to obtain. Gerhardt's treatment includes an English version of the keys, but the species descriptions are not translated from German. Ola'h's text is entirely in French; I have translated the key into English, but not the species descriptions. Brietenbach, J. & Kränzlin, F. (1995). Fungi of Switzerland: A contribution to the knowledge of the fungal flora of Switzerland. Volume 4. Agarics. 2nd part. Transl. Walters, V. L. & Walters, J. F. Lucern: Verlag Mykologia. 368 pp. Gerhardt, E. (1996). Taxonomische Revision der Gattungen Panaeolus und Panaeolina (Fungi, Agaricales, Coprinaceae). Bibliotheca Botanica 147: 1–149. Guzman, G. (1978). 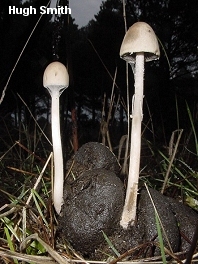 A new species of Panaeolus from South America. 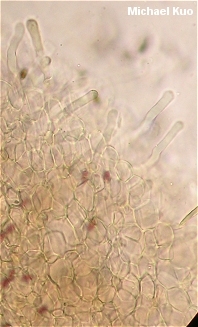 Mycotaxon 7: 221–224. Moser, M. (1984). Panaeolus alcidis, a new species from Scandinavia and Canada. Mycologia 76: 551–554. Ola’h, G. M. (1969). Le genre Panaeolus: Essai taxinomique et physiologique. Paris: Herbier Louis Marie. 273 pp. My translation of the key in this text is available here. Overholts, L. O. (1916). New or interesting species of gill fungi from Missouri. Annals of the Missouri Botanical Garden 3: 195–200. Smith, A. H. (1948). Studies in the dark-spored agarics. Mycologia 40: 669–707.